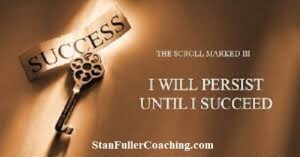 The Scroll Marked III - I Will Persist Until I Succeed! Would You Give Your Life Away? Do You Love your Business,..
How many of you have a favorite film that you have watched several times and it never becomes boring or monotonous? There are classics that I would watch with my mother every year, especially during the Easter season. Some of these classics I couldn’t get at the video store, so I would go the library and borrow them, and then we could watch them for a week. This was a yearly event for us and the films never became boring or monotonous, year after year after year, I knew to get these classics so we could enjoy our special time together and share the bonding experience that still inspire me to this day. You see the classics never get old; they just seem to get better with age. Just as I did with the films, there are also classic books that I read at least once a year. One of those books is by Og Mandino's, The Greatest Salesman in the World. I don’t just read this powerful book, I make it a yearly study. I make it a practice to read the 10 scrolls as outlined by Og, at least once a year. Early on in my career as a young insurance unit manager, I was 21 at the time, one of my agents brought a copy of The Greatest Secret in the World to one of our private sessions and handed it to me. I couldn’t put it down. Og Mandino wrote The Greatest Salesman in the World, as a result of the response of his former work and to provide a personal development plan and discipline that would propel the reader's achievement and accomplishments to unbelievable proportions. As a young salesman that wanted to the best, I was into personal development, I had already discovered Napoleon Hill, W. Clement Stone, Dr. Norman Vincent Peale, Zig Ziglar and others, but when I was introduced to Og Mandino’s The Greatest Salesman in the World, he was speaking directly to me. 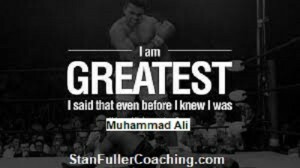 Like Muhammad Ali, I wanted to be “The Greatest!” Please don’t get me wrong I am in no way comparing myself with “The Greatest” Muhammad Ali. It was my desire to become a great salesman, in fact I wanted to become The Greatest Salesman in the World. For those of you who laugh and scoff at the previous sentence, I say, if you don’t have a desire to be the very best at what you do you are cheating yourself and your family, if you are married and have kids, and you are cheating the world of your extraordinary contributions if you are not committed to being the best. I have used this book to achieve extraordinary success in sales, management, and as an entrepreneur. If you have never read this classic I recommend you get it and make it a part of your personal development study. I gave it as a gift to my sales team several years ago, I had been reading from it in many of our meeting and I know the profound affect it had on me and I wanted to pass it forward. you can do as I did, you can find it on Amazon. As I have read many times, I Will Persist Until I Succeed, I will persist, I will win! 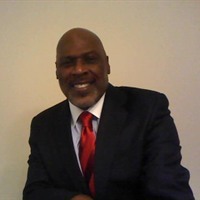 Looking for a vehicle that can make your Annually Income Suddenly Become your Monthly Income: THE SOLUTION!